I had a whole lot happen this week, but unfortunately I don't have a lot of time to do it in. Being a zone leader requires I write the branch president 2 letters, and help all the new missionaries on how to write the mission president and their families, and with only an hour, I’m already down to 10 minutes left, and have already used up 4 of them. I really can't quite remember how things were when we left, but I would like to know what's going on. WARNING: I will read your letters, but I may not respond to you in a super timely manner, or in depth, that may have to wait for the mission field. Whew, I’m tired now, so look forward to hearing from you! But kind of what I said earlier to my branch president, I really am not homesick. Right now, I feel like I’m gonna miss the MTC more than I miss home right now. Pictures are incoming as soon as I can figure out a way to turn on the computer without 7 clerks and 3 branch presidents making sure I did it correctly. Last Words: The mission's going great, love the MTC. Love and miss all of you guys, remember, the Lord's always there for you when he asks. I do enjoy packages (kidding). I'm always thinking and praying for all of you. So a few interesting things happened this last week, and I don't get much time to type a whole lot so I’m typing as fast as I can so I can get most of it (if not all of it) down on paper. Since I have to write two separate letters to my branch president, my time is cut quite short to write to all of you back at home (or in Utah). So as you who have been on missions may have already figured out by the double letter thing to my president is that I have been called to be Zone Leader. It's quite exciting but really crowds my schedule. I get to welcome the new missionaries that come every Wednesday, teach them how to do a lot of things, and if they have problems or questions, they can come talk to me and discuss them. I also hold weekly meetings with my District Leaders (DL's) and also with the branch presidency. Since the MTC wants special musical numbers at almost every meeting that has more than one zone attending, they are in desperate need of accompanists so when I was playing with a small group of Elders from my district, I heard them saying that if they didn't get an accompanist soon, they wouldn't have enough to play for all of the meetings. So, I volunteered, and the moment I did, they had me play a song to audition (I played Remembrance from the album), play the song with my district, and then they had me accompany a singing duet who were right after that. Then they told me that I was their most talented accompanist, and then told me to find a solo church song or arrangement and audition it for next week (I can hear you groaning and thinking...dad..."I hope he knows what he's getting himself into"). The first song (with my district) did well enough to be assigned to play at the departure devotional Sunday afternoon and the Duet one got assigned to play at the Sunday Evening Devotional. I'm pretty excited to play 'cause those are both pretty big meetings where the majority, if not all of the MTC occupants attend. Getting pictures to all of you while I’m at the MTC is probably going to be impossible as the computers here are very restricted, I’m surprised they let you move the mouse around. write me between that Same Friday and the next Monday. The MTC gives me your letters in printed format no matter what and I don't have time to read your letters and respond to them in the small window of time I have to respond to them. So PLEASE write them between Friday and Monday (Tuesday's okay, but any later starts becoming difficult). If any of you have any questions for me, please ask them, I’m happy to respond. So let’s see...what's something all of you would like to know? I Know! 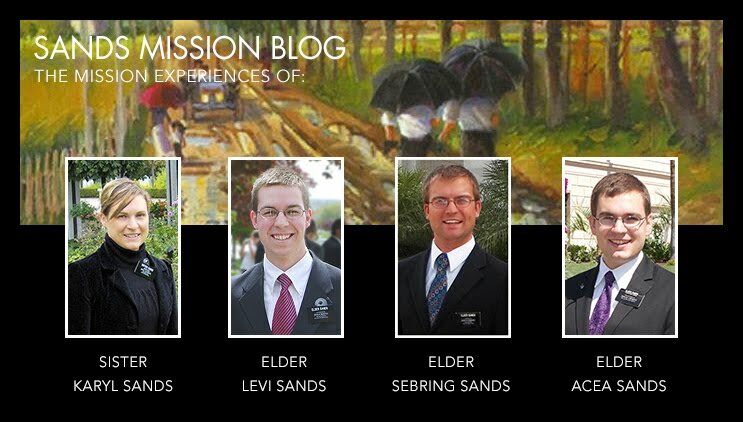 How about my average day at the MTC? First we wake up, then we eat breakfast, then we go to class for several hours. After class, we get to eat lunch. After lunch, we go back to class. After several more hours there, we get to have Dinner. After dinner, we go back to class until 9:30 when we get to go back to our residences, do whatever until 10:30, then go to bed. It's all pretty simple. On P-days, it is so unstructured, that we almost always have nothing to do. We do laundry and get to write letters while that's going on, go to the temple in the afternoon, and then after dinner, we go to class for 3 more hours and then go back to our residences. Sunday is the day where we have meetings, followed by meetings, followed by meetings, followed by meetings, followed by meetings, followed by lunch, followed by meetings, followed by meetings, followed by meetings, followed by Dinner, followed by meetings, followed by meetings, followed by meetings, followed by bed time. And then the week starts over again, and well...not much different happens. Here's a brief list on what exactly is amazing about it. 8: Am I making you jealous yet? My schedule mostly consists of going to class a lot and doing quite a bit of studying but it's quite enjoyable. I am actually the least experienced person in my district and I know the least amount of sign but my companion is really helping out in that regard. I'm running out of time so let's get some of the important stuff out of the way. I will be leaving the MTC Feb. 23rd and due to a few weird things happening, I may not be able to write every week, and I may not be able to read your letters to me every week. So don't think I was brutally murdered in a dark alley somewhere if I miss a week or two. I do have an address here at the MTC, but I don't have it with me, I’ll have to get that to you next week. My teachers are hearing (though I've never heard them say a word, total immersion and all of that) and I would give you their names, but I only know them by their name signs and it's a little difficult to put those names into a written language. Again, I thank you all so much for supporting me on my mission and will miss all of you so much. I know this church is the true church of God, and that I am exactly where I’m supposed to be. Hope you all understood that. Elder Sands spending some time with the Carmen's and at the MTC. Acea being set-apart and leaving for MTC.